What’s the difference between an average agent and an indispensable intermediary? Value. 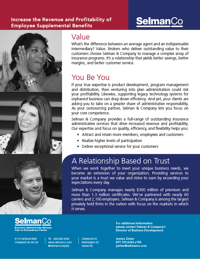 Brokers who deliver outstanding value to their customers choose Selman & Company to manage a complex array of insurance programs. It’s a relationship that yields better savings, better margins, and better customer service. Q. What if the carrier wants to retain administration of commissions and/or claims? A. Selman & Company can tailor full service administration of employee supplemental benefits to meet the needs of a carrier. A carrier can retain the commissions and/or claims administration and we develop an extract to provide required data to the carrier. Q. How long does it take to get up and running? A. With a dedicated team at Selman & Company and at the carrier, implementation for a product that has completed the development and filing stages requires a minimum of four months. Q. How is a carrier able to measure our performance in the administration of their business? A. We work with each carrier to establish guidelines and standards for all aspects of administration. 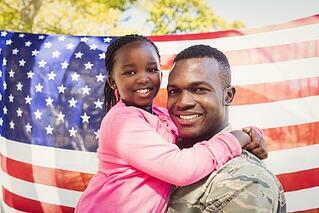 The standards of performance are captured and provided to the carrier through regular reporting. Complete the form on this page to download the employee voluntary benefits sales sheet. How can your voluntary benefits program run more efficiently?